During the week of 02/29/16, a single toll exit lane will be closed, M-F, 8:00PM to 5:00AM. On or about March 6, 2016, eastbound 53rd Street, between Broadway and Avenue E, will be reopened. Normal two-way traffic will resume going in and out of Bayonne. 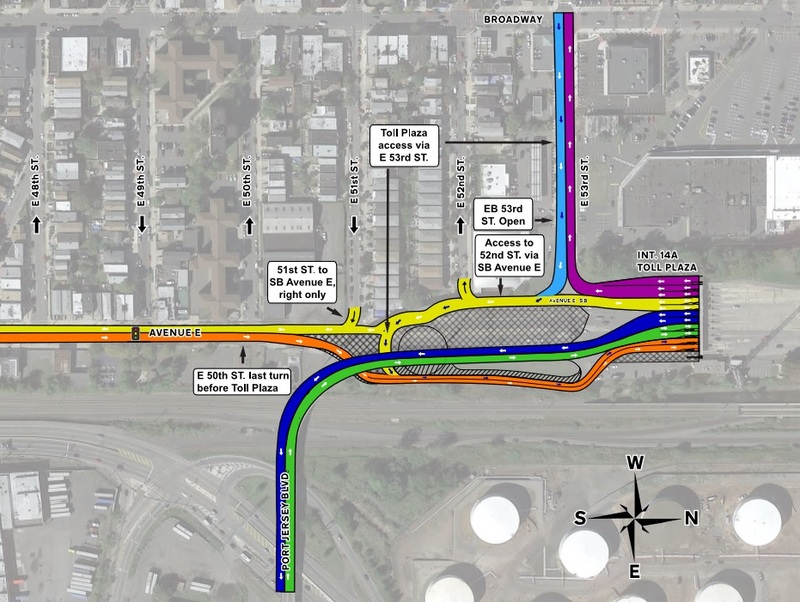 Access to the Toll Plaza will be restored via the new roundabout south of 52nd Street. Motorists can follow the new roundabout to the Toll Plaza or continue south on Avenue E. For more information, please CLICK HERE to access the pamphlet. Roadway drainage and pavement construction will continue. Access to westbound 53rd Street from the Turnpike will be closed during the weekend of 02/26 through 02/28, 8:00PM Friday to 5:00PM Sunday for roadway reconstruction. Access to local business including Value City Furniture and QuickChek will be maintained via 52nd Street. This work will be supported by Bayonne Police. Southbound Avenue E traffic will be diverted to 52nd Street on Monday, 02/29, 8:00AM to 3:30PM, for roadway reconstruction. This work will be supported by Bayonne Police. Temporary traffic signal work is being performed in the intersection. Temporary signals are scheduled to be activated the week of 02/29/16. This past Thursday and Friday, Feb. 18/19th, public outreach efforts began to disseminate information about the forthcoming traffic shift which will be fully implemented on or about March 6, 2016. A new pamphlet began circulation around Bayonne residents and businesses in the project vicinity, including several extra copies placed at Value City Furniture and QuickChek on E. 53rd Street. This new full-color, two sided pamphlet announcing the reopening of E 53rd Street with restored access to the Toll Plaza is available here for download and printing by clicking the link below. If you have questions, please call our toll-free 800 number or email the project outreach team at info@NJTA14A.com for a prompt response. Thank you. During the weekend of 02/26/16 through 02/28/16, westbound 53rd Street will be closed at Avenue E, 8:00PM Friday to 4:00PM Sunday, for roadway construction. All westbound 53rd Street traffic will be diverted to 52nd Street. All E 53rd Street businesses, including Value City Furniture and QuickChek, will remain open during this period with access provided via Broadway from 52nd Street. This work will be supported by Bayonne Police. During the week of 02/22/16, a single toll exit lane will be closed, M-F, 8:00PM to 5:00AM. 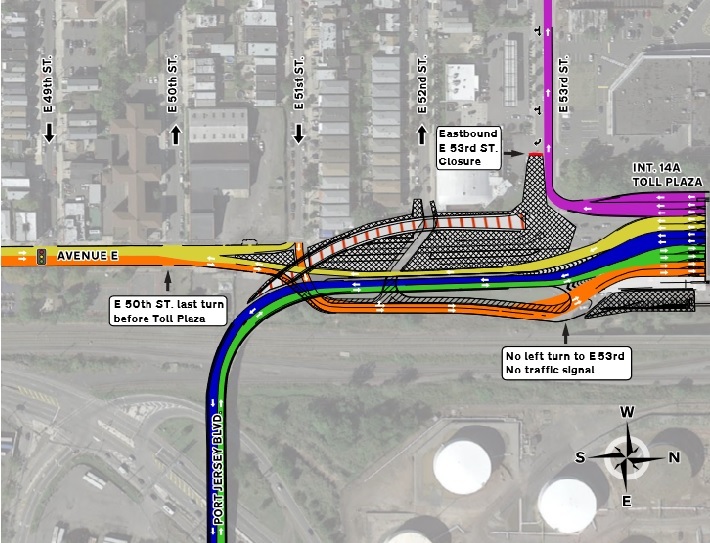 Southbound Avenue E will shift west to its permanent alignment, and access to 52nd Street will be from southbound Avenue E only. 51st Street will be changed to a right turn only onto southbound Avenue E on or about March 6, 2016. During the week of 02/15/16, a single toll exit lane will be closed, M-F, 8:00PM to 5:00AM. On 02/16/16 and 02/17/16, 8:00AM to 4:00PM, southbound Avenue E will be detoured to local streets to allow for utility construction. This work will be supported by Bayonne Police. Temporary traffic signal work is being performed in the intersection. During the week of 02/08 and o2/15/16, a single toll exit lane will be closed, M-F, 8:00PM to 5:00AM. Traffic from the Toll Plaza to Port Jersey Boulevard and Route 440 has been shifted left (east), onto the existing (one-way) bridge in a two-way pattern.